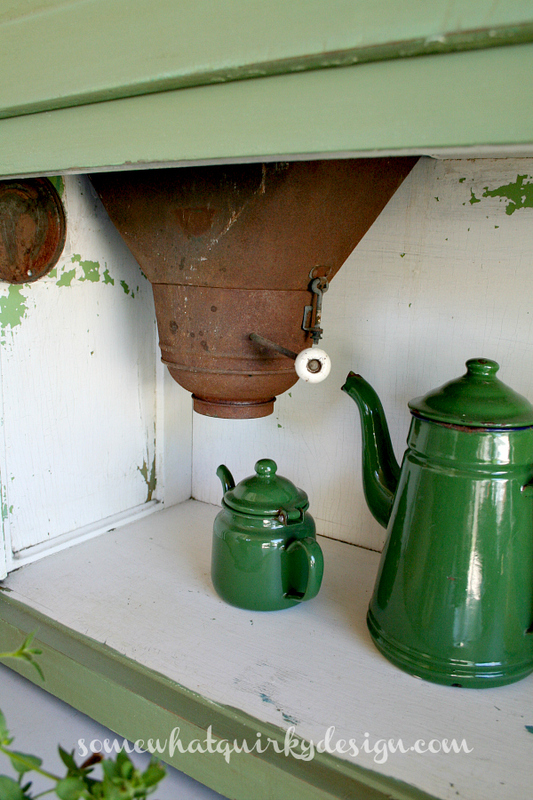 I have this hoosier cabinet. It sits on my back porch. I use it to hold garden stuff. When I first got it, it was painted white. That first picture was taken after I scraped off the peeling part. The bad person that I am did not seal the freshly peeled paint. So the white paint peeled off in big chunks. 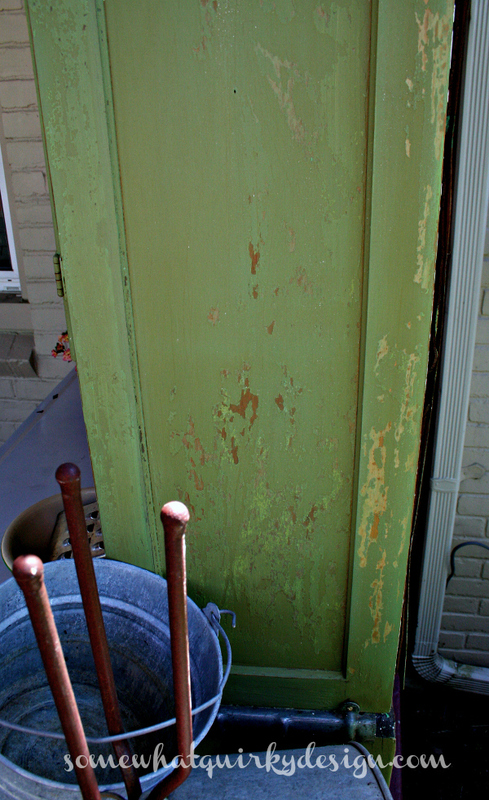 And bits and pieces of the 3 layers of green paint peeled off in little pieces. And I got tired of sweeping up paint. And water ruined the veneer layer on one of the sides. 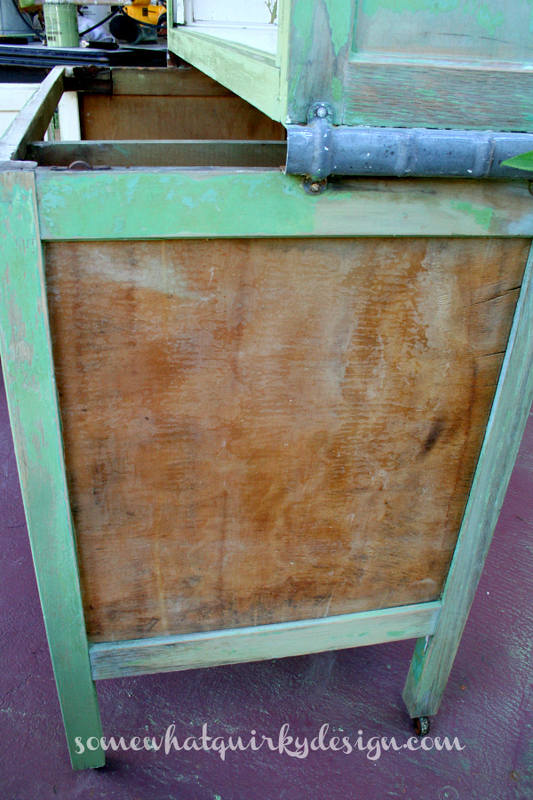 So then the beautiful hoosier cabinet got ugly. I know. This picture makes ugly look kind of interesting. And by the time all the flakes and ruined veneer came off it looked a little like this. And this picture is flattering. Then a layer of Miss Mustard Seed Hemp Oil. 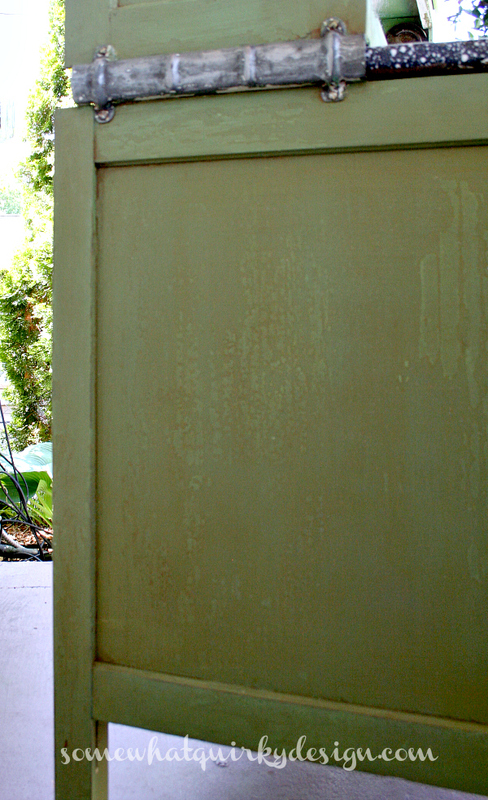 Then a coat of CeCe Caldwell Light Antiquing Wax. To seal the hoosier cabinet. The guy at the Benjamin Moore store swore it was non-yellowing. We'll see. 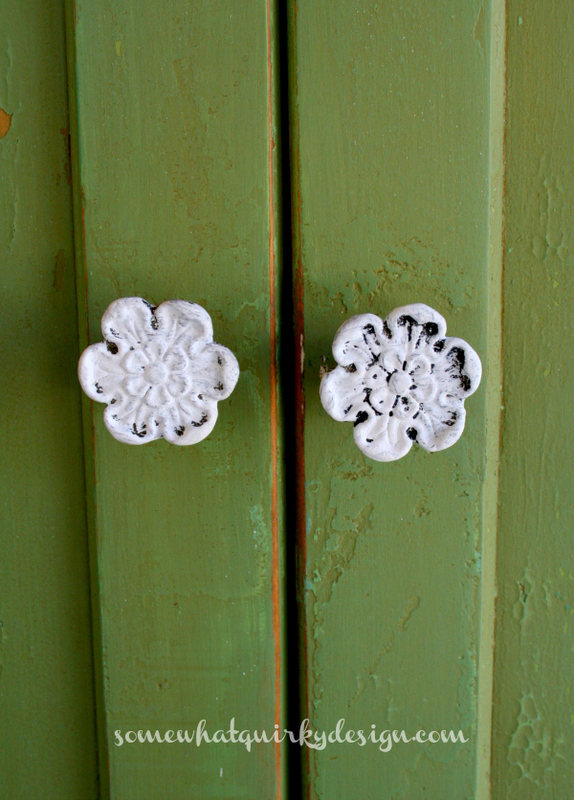 Then I found 6 knobs at the Pier 1 for 99 cents each! They were brassy and I didn't want brassy. So I brushed some white paint over them. I wanted to find some neat little garden tool knobs. For about $25 bucks each. The whole cabinet is still a little boring to me. I loaded her up with some colorful stuff. 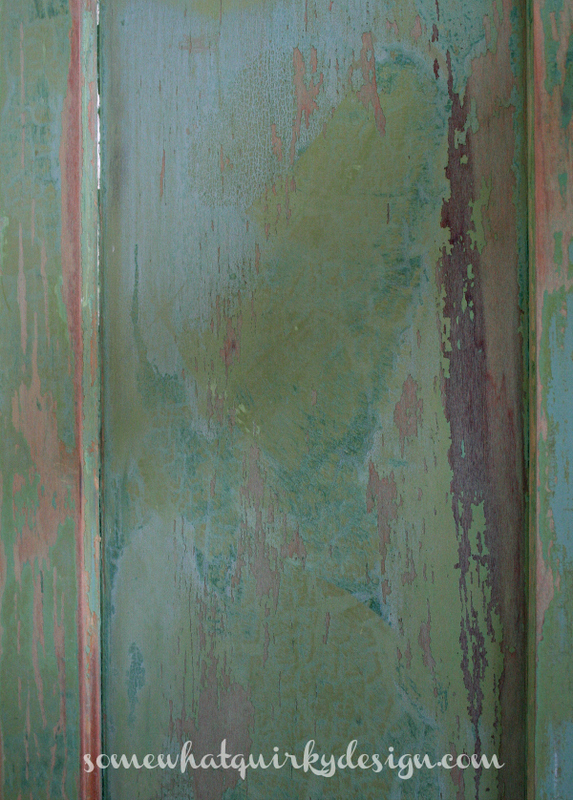 I love the old green showing through. Notice how the knobs don't line up? The wood panel on the back of the top cabinet is warped and loose and the cabinet is off square. I guess I need to replace this panel. So the cabinet can be square and all. 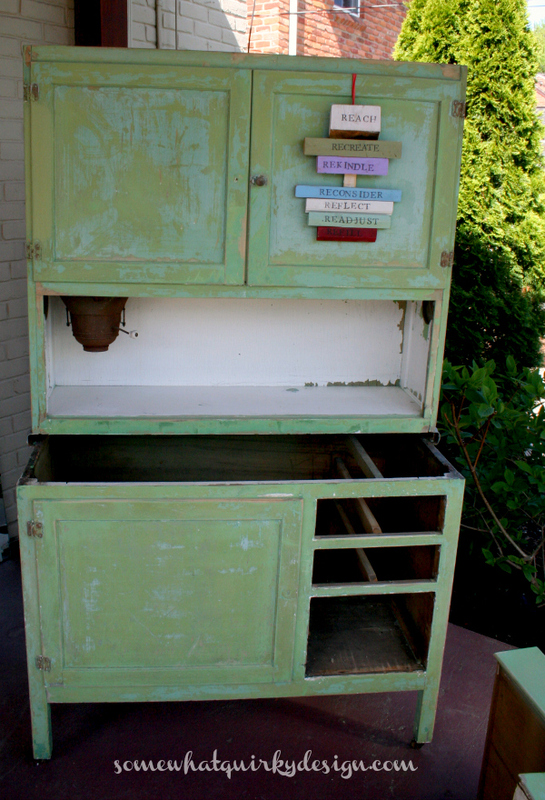 I like the idea of the whole hoosier cabinet thing. 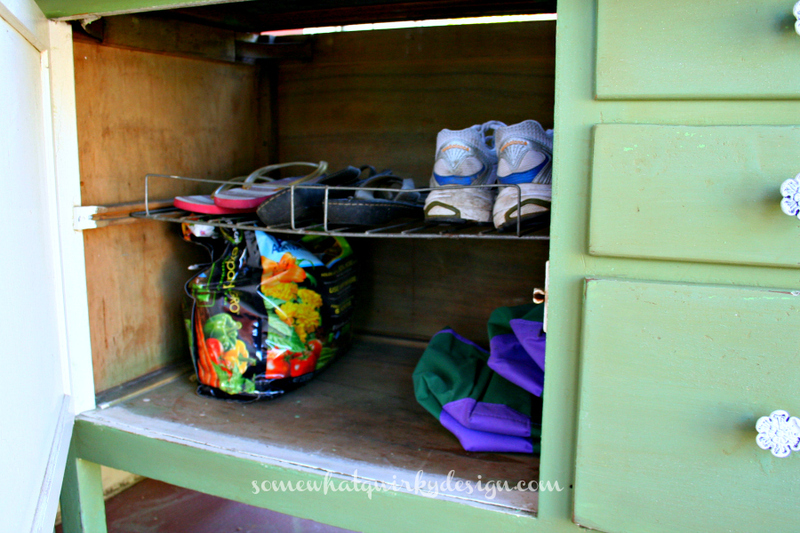 See that rusty flour bin? With the built in sifter? Tell me that wouldn't be way cool to have in your kitchen. For a cool $175 bucks I can get a replacement one. 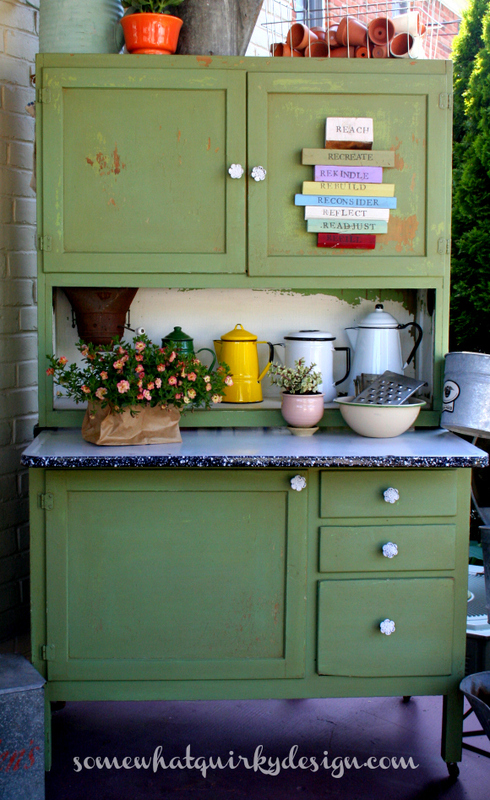 If my kitchen was big enough for a cabinet like this I would SO have a hoosier cabinet in it. 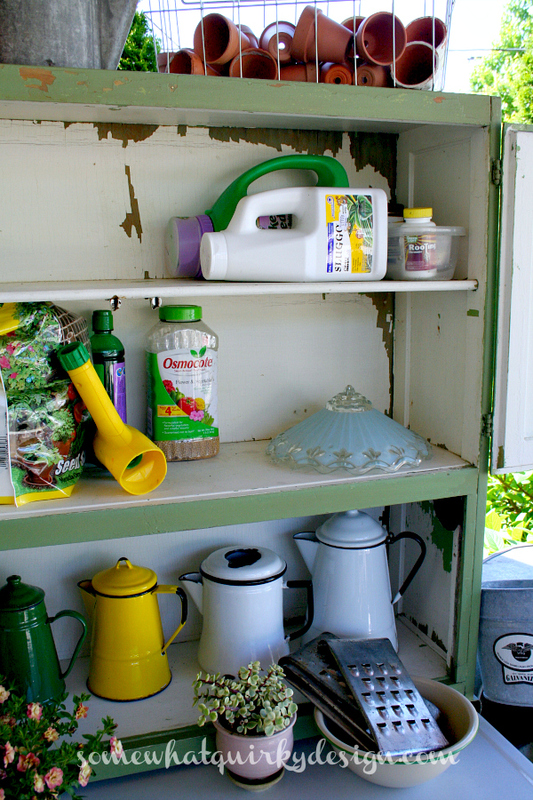 You can get a sugar bin/dispenser, a hanging rack of spice jars, an extracts rack, and many other amazing accessories. I would have the most rockin' baking station imaginable. Wow! I just noticed that I took this picture while the bowl was falling backwards! Did I mention I have a weakness for buckets? Which is better? 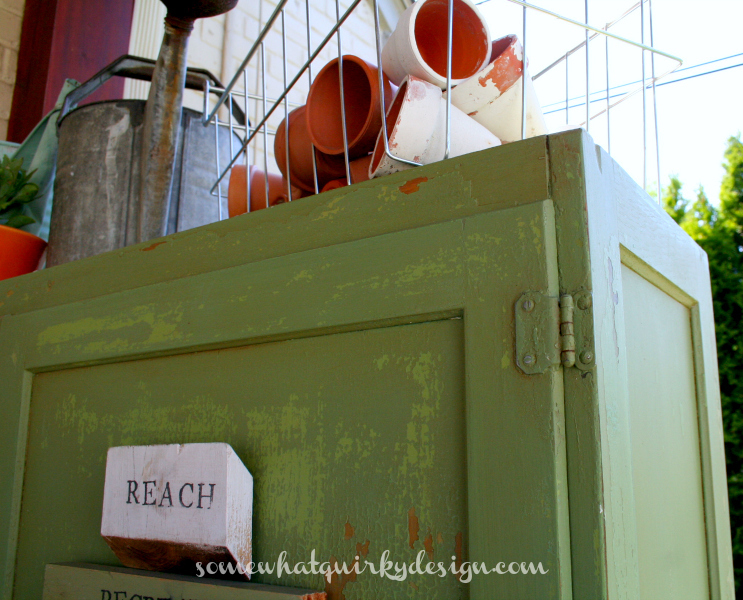 Galvanized buckets or hoosier cabinets? 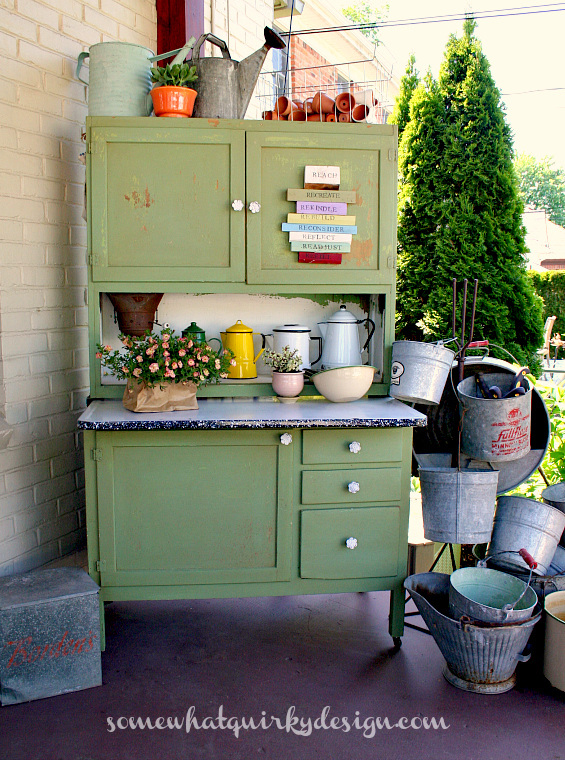 I want both - galvanized buckets and a Hoosier cabinet. It's not boring at all Karen, it looks great. I only noticed the gorgeous enamel top in the after photo, so I think the paint and new handles have really brought the look together. I love your old Hoosier! I've always wanted one, but our kitchen doesn't have an inch of space to spare. 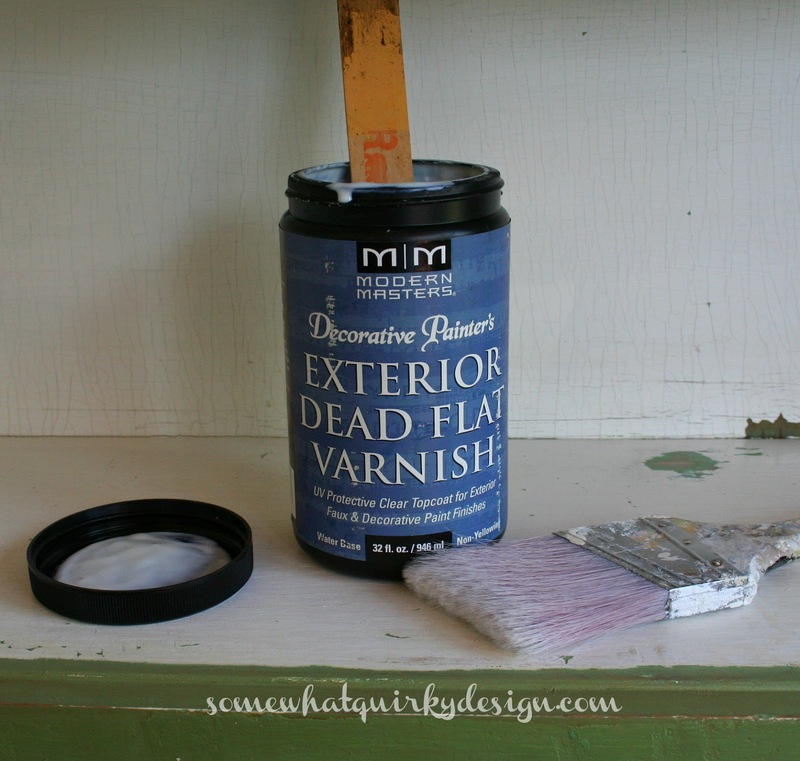 The paint looks like it's decades old and you've found the perfect use for it. Great transformation! LOVE IT!! and everything else that you have used to decorate it and create this wonderful display!! O, my...The Hoosier turned out turned out great! I love the bright accessories,too! 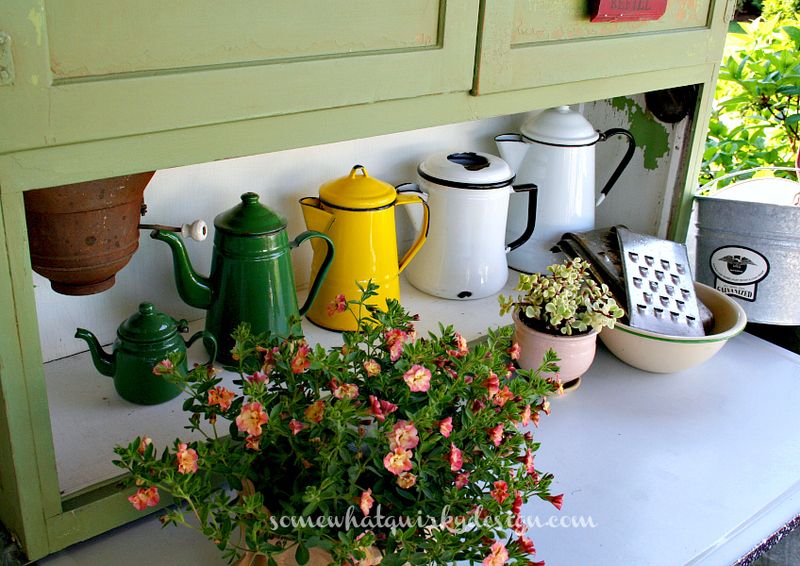 I love a good Hoosier cabinet. It looks awesome! 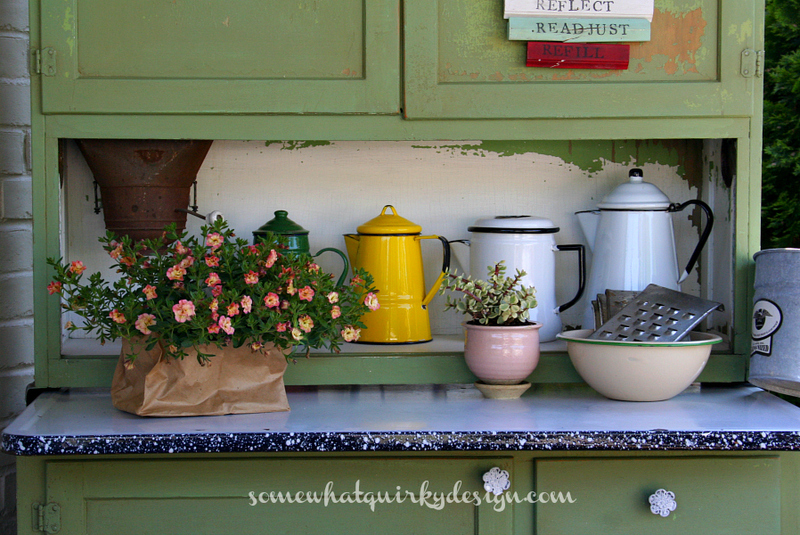 Oh my goodness, I love the finished Hoosier cabinet! You did a great job!! Also, who doesn't love old galvanized buckets?? What a wonderful collection and display of both the cabinet and the buckets! Oh my, a girl after my own heart! 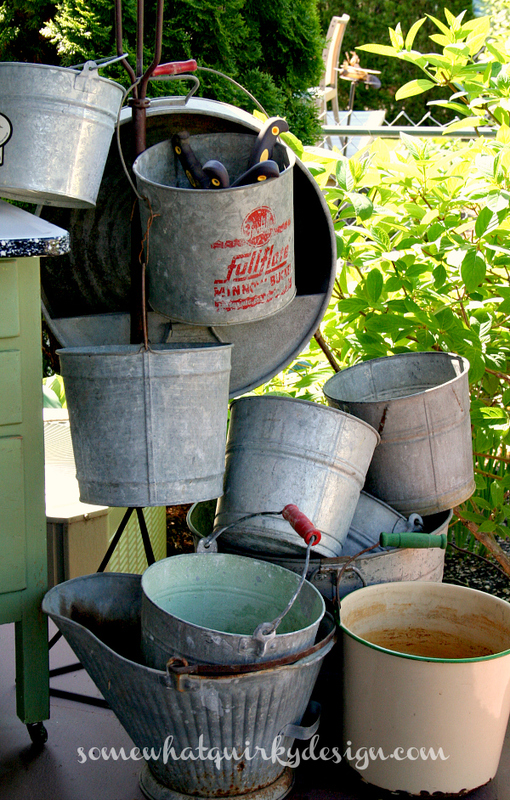 I love galvanized buckets and I have a Hoosier in my basement farmhouse kitchen. Love, love how yours turned out! The chippiness is just wonderful! I painted my hoosier white when we finished our basement last summer. Wondered if I should be covering up that oak. But have not regretted it for a minute. Love it white! Mine does not have the flour bin. sob! Fabulous! I have a couple minnow buckets and a coal bucket. Love how you have them hanging. Wondered what you used? I have a link party, Share Your Cup Thursday. It's about sharing the things you love. I'd love if you shared this! I think I've written an essay here. lol! Happy to have found you and now following. Wow! I REALLY like that cabinet! It's got great character, and you've styled it perfectly! Great job! 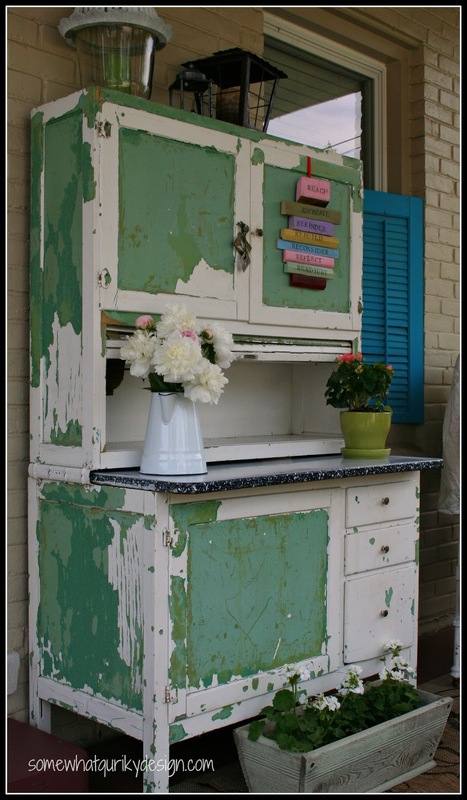 I'm visiting via SSS, and as soon as I saw your Hoosier cabinet, the beautiful colour and the styling, I melted, kinda like the layers of your previous paint! Gorgeous!! Karen, thanks so much for linking up to Share Your Cup! I will be featuring you this week. 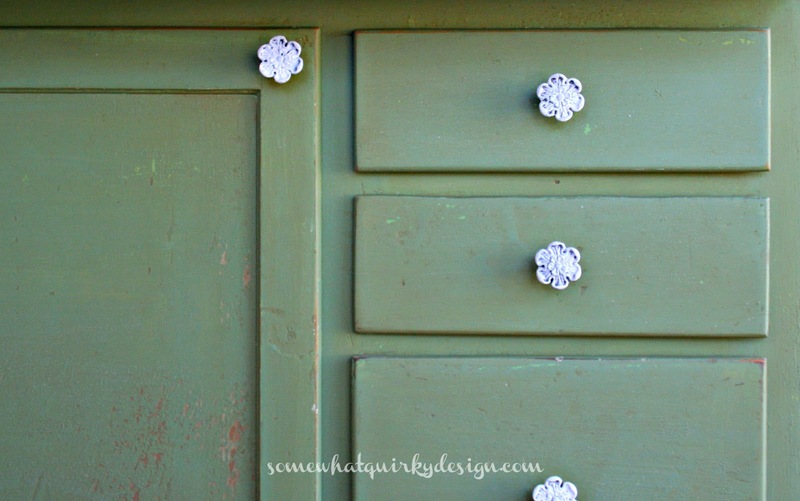 Oh my...this cabinet is sooooo full of charm! Lovin' the buckets too! 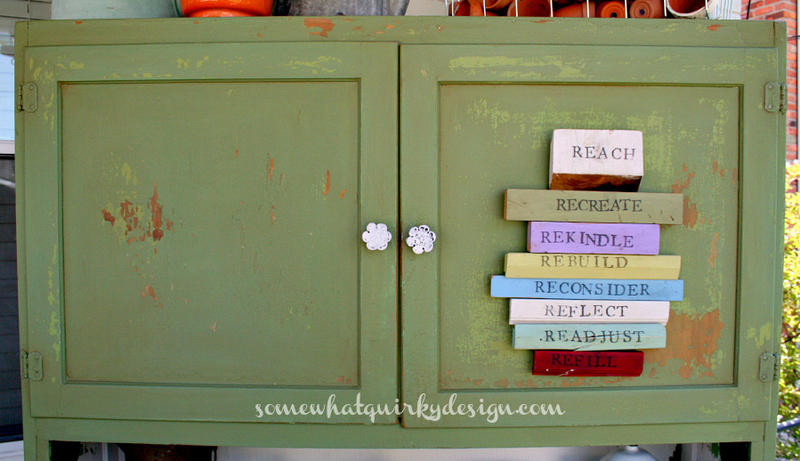 Love, love, love this cabinet. That's a great green color too. The color is very vintage looking. Buckets or hoosier? I love them both. Great collection. the cabinet is fantastic. I would just put it in another area and use it as a baking station. Who says it has to be in the kitchen? Love the colors and everything about it. love buckets too, but cabinet is best! Saw this on pinterest, and had to come over to take a look at the before and after. I like it!! What a great transformation. I don't have room in my kitchen for a Hoosier, either. When I found the Hoosier of my dreams on CL, I decided that it would be a perfect addition to my sewing room instead. The shelves and drawers hold fabric and supplies, and my cutting board fits perfectly on the pull-out metal counter. Think outside the box and get this lovely thing into the house. It could be an entry piece, a dining room server, a quirky dresser in the guest room ... the sky's the limit!